Welcome to Cottage Magpie, one of many stops on several awesome Christmas tours (more on that below). I hope that after you visit my home, you'll make a point to visit everyone else on the various tours. I had the first part of my holiday tour last week, and this is the second part. This part of the tour features my living room. This is my special tree with the colors and decorations that I love, that the boys in the house aren't interested in. 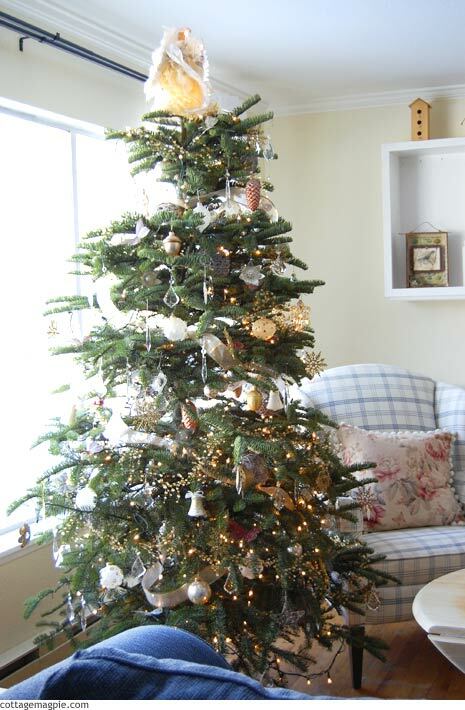 It's silver and gold and white and because of the many nature-inspired ornaments, I call it my fairy tree. 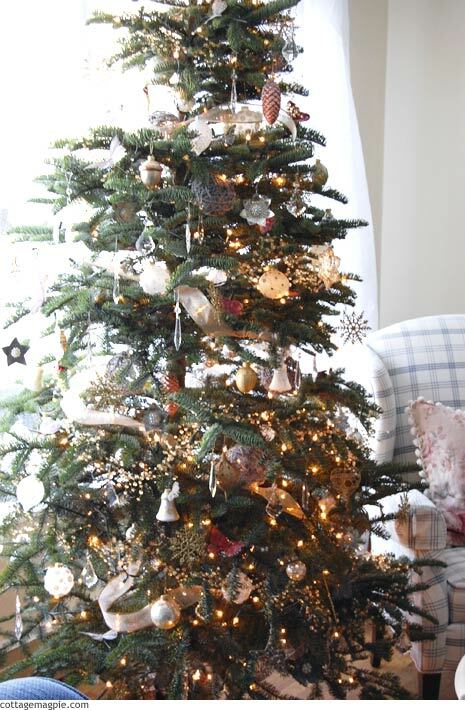 I love all the sparkly sparkles of the gold, silver, crystal and white on the tree. I really wanted the tree to look full, so I made several more ornaments this year, and I'll be posting how to information as the week goes on. And of course, no silver and gold fairy tree would be complete without an angel on top. Or maybe she's a fairy angel? Could be. This room of the house is starting to become a sanctuary of sorts for me. No one else uses it, so I am taking it over for myself. I've started redecorating it, too, and though I haven't gotten far, I can't wait to show you my progress after the holiday. For now, if you looked carefully, you may have noticed a sneak peek at some thrifted furniture. More on that soon.